A bed bug infestation can be both hard to spot and difficult to cope with. You might not notice signs of bed bugs until they’re firmly established in your home, but it’s important to take steps to eradicate them as soon as you notice that they’ve appeared. In this step-by-step guide, we’ll give you some tips on how to get rid of bed bugs from your home. First things first, what are the signs of a bed bug infestation? The main warning signs include red bite marks and rashes appearing on your skin. You might also spot evidence left by the bugs themselves on bedding and furniture, such as: yellow shedded skin left behind by growing larvae, eggs and eggshells, tiny dark spots and bloodstains left in fabric. Planning your strategy is imperative. You’ll need to find where the bugs are hiding before systematically treating the affected areas. Despite their name, bed bugs aren’t solely found in and around beds. They like to hide in every nook and cranny they can find – including carpets, inside cracks in furniture, along skirting boards and amongst fabrics. Search your home thoroughly. Check any wooden furniture – empty out dressers and wardrobes – and make sure to examine any cracks or crevices in the woodwork. Next, it’s time to start the treatment. For affected clothes, fabrics and any smaller washable items, wash and tumble dry them at a high temperature; the steam should deal with any bed bugs left hiding in the fabrics. If you can’t wash certain items, you can try using a focused steam clean. Spray steam at any seams, corners or splits to eliminate any living bed bugs and their eggs. There are some items that you might not be able to wash. These can be sealed in plastic and left in a warm location to heat up – hopefully killing the bed bugs. For larger items that are infested, it might be more prudent to dispose of them instead of trying to treat them. Older furniture, for example, might be better off thrown out instead of attempting to eradicate bugs from every crevice. Bed bugs, their eggs and their larvae can make carpets, curtains, bed sheets, mattresses and rugs their home. Take the vacuum cleaner to any and all fabrics in the property and be thorough. Bed bugs often congregate through seams, edges and corners, so focus your attention on these. Whenever you empty the vacuum, make sure to seal the remains in a bin bag before throwing them out. Once finished, steam clean your carpets to kill off any eggs or bugs that might have been left behind. Bed bugs don’t rely on a dirty environment, but they can thrive in a cluttered one. Lots of clutter means lots of places to hide, so decluttering your home is a good way of eliminating a chunk of an infestation. Before disposing of your stray items and furniture, use the above treatments to kill off as many bugs as you can, then safely get rid of the remains to remove as many hiding places as possible. While not a pleasant thought, it’s common for bed bugs to use cracks in walls and tears in wallpaper to set up shop. If you have loose wallpaper, consider replacing it or simply sealing it back up to cut off entry for the bed bugs. Cracks in exposed walls should also be filled and sealed to prevent bed bugs from gaining a foothold in your home. Frustratingly, even after attempting a DIY treatment you still might find evidence of an infestation. At this point, you could try re-applying the previous line of treatment, but it’s recommended to call in a professional pest control expert. Specialist pest control technicians have a variety of treatment plans available, and because they know exactly what signs to look for – and are wise to the common hiding places and habits of bed bugs – they’ll be able to deal with the problem without hesitation. They’ll also be able to advise on the most effective means of prevention, tailoring this to your property. If you’ve discovered signs of a bed bug infestation and require professional help to rid your home of the pests, look no further than ClearFirst Pest Control. We offer proactive pest control services including full inspection and removal of bed bugs from your home. To discuss our services or to arrange a quotation and home survey, simply contact us today. 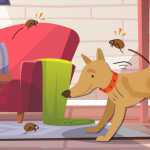 Do Fleas Die Without a Host? Do All Moths Eat Clothing? Can Cockroaches Survive a Nuclear Blast?